How do we love thee, oysters? Let us count the ways. There’s a reason oysters are a permanent fixture on Valentine’s Day menus! They’re one of the most famous aphrodisiacs and have a reputation for love and fertility. 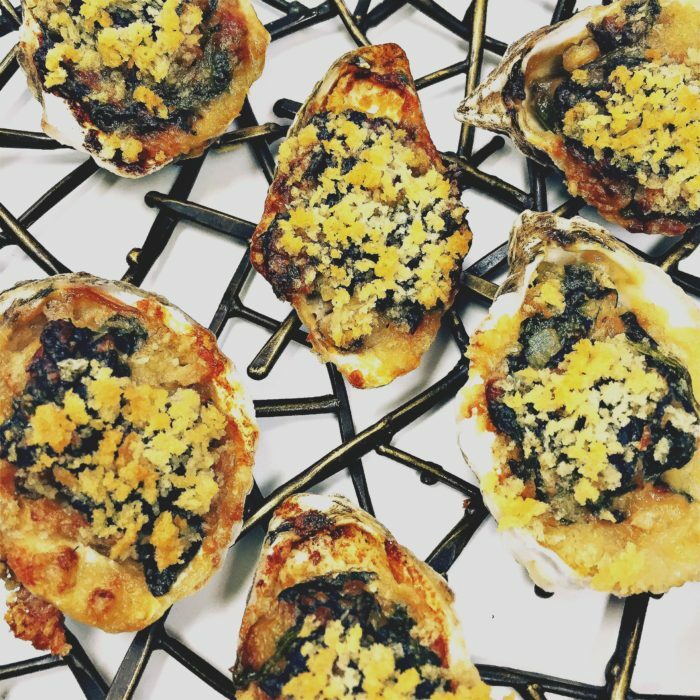 If you’re looking to spark some romance this year, make this delicious and easy recipe for Baked Oysters Florentine, courtesy of Marcia Selden Catering. Heat butter in a large non-stick skillet over medium high heat, when butter has melted add shallots and cook, stirring occasionally, until soft, about 4 minutes. Add white wine and baby spinach and cover with a lid. Let steam until spinach has wilted, about 4 minutes. Remove lid and stir until all liquid has evaporated, about 4 minutes more. Add cream and parmesan cheese to the spinach mixture, remove from heat and allow to cool. Season to taste with salt and pepper. Divide spinach mixture between shucked oysters (about 1 tablespoon per oyster). Place oysters in roasting pan or sheet pan and place in preheated oven until breadcrumbs are brown, about 6 minutes. Serve immediately. For more recipes, feel free to email our Executive Chef Robin Selden, robin@marciaselden.com.